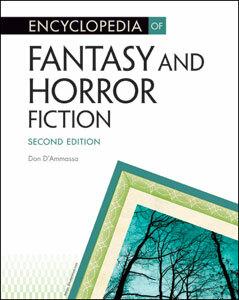 Encyclopedia of Fantasy and Horror Fiction, Second Edition provides comprehensive coverage of the major authors and works in these popular genres. Each entry includes a brief discussion of the author's life and work and also analyzes its literary merits and place within the tradition of fantasy and horror. This updated and essential volume focuses on hundreds of writers, including many whose work is taught in high school and college, such as C.S. Lewis, J.R.R. Tolkien, Stephen King, Edgar Allan Poe, H.P. Lovecraft, R.L. Stine, and Bram Stoker. Encyclopedia of Fantasy and Horror Fiction, Second Edition also includes entries on such works as the Harry Potter series, The Chronicles of Narnia, The Lord of the Rings, and many more. Perennial favorites, such as each volume of The Lord of the Rings trilogy and of The Chronicles of Narnia series, The Wizard of Oz, Peter Pan, and many more. Written by a well-known writer of horror and science fiction, Encyclopedia of Fantasy and Horror Fiction, Second Edition provides an in-depth examination of the literary realm of elves, vampires, unicorns, ghosts, magic, and more and is sure to delight and intrigue students of all ages. Don D'Ammassa, the author of Facts On File’s Encyclopedia of Science Fiction, is one of the world's leading experts on science fiction, fantasy, and horror. He is a professional writer and book reviewer who has been working within these genres for almost 30 years.